By offering users the cloud features they require, Transporter eliminates the temptation to use unauthorized public cloud solutions and returns control of the data to IT. 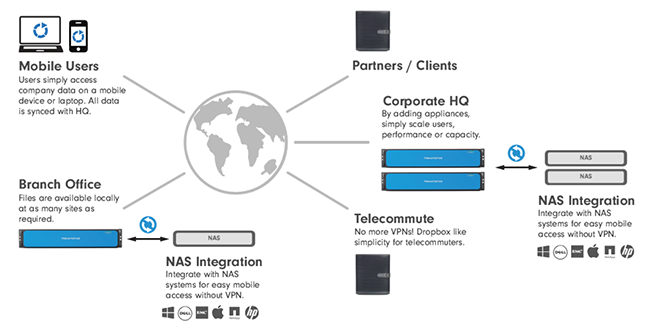 The appliance deployment model gives businesses ownership over the physical location and redundancy of data and scales from one to hundreds of nodes to support as many users as required. 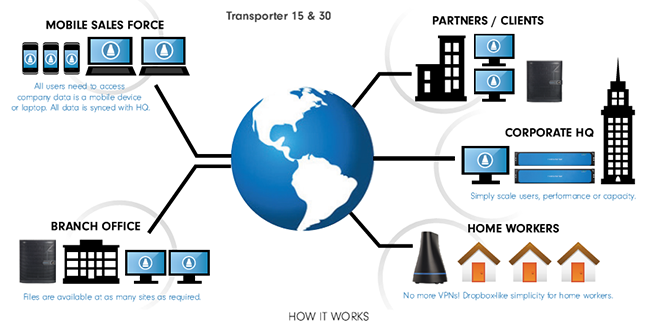 Transporter on-premise, private cloud appliances scale to meet the demands of any size of business. Their deployment model means organizations never reach a capacity ceiling, they simply add another Transporter when they need more users or storage. Transporter 75,150, and 500 rack-mounted models are ideal for scaling in the data center and include our Network Storage Connector to sync with files stored on existing NAS systems. Whether you want to work while on vacation or download documents on a business trip, Transporter gives you easy access to your shared folders, on all of your devices, regardless of where you are. Everything stored on Transporter including the contents of folders others have invited you to share ­ regardless of size or type ­ are easily accessible using the free desktop software or iPhone® or Android device apps. Today we work 24×7 and often it’s away from the office. To stay connected we use our mobile phones for email and business, even on vacation. When roaming, service provider data rates can get expensive and it’s hard to send and receive large files. This is where Transporter’s ability to send links to files can really help especially when files are several megabytes in size. Just swipe the file you’d like to send and a simple email linking the file is created for you to mail to the recipient. Then they just click the link to download the file directly from the Transporter and not from your phone. Today, everyone in business has their mobile phone no matter where they are, but sometimes it’s difficult to access your Mac or Windows PC when you need to open an important file in an application like Microsoft Word. If you’re a Transporter user there¹s no problem because you can tap the file’s name and the file will automatically open in your preferred app. Any edits made to the file will be saved and will automatically sync with other locations. By using your mobile phone you can safely and securely access your files and work on them anytime, anywhere! How-To on Sharing Files and Folders on your Transporter - on your PC. Contact us to find out more about Connected Data products! Our specialists are expert in designing enterprise file sharing systems and can help you create a plan for sourcing and deploying your Connected Data solution. Optrics offers personalized Connected Data file sharing solution training - a service designed to help you integrate your Connected Data solution smoothly into your network infrastructure.